During its umpteenth rerun Saturday night on NBC, Frank Capra’s It's a Wonderful Life scored a slight but measurable ratings victory over Elf (on CBS) and Finding Nemo (on ABC). And yes, I admit: I watched (for the umpteenth time), and likely will watch again (when NBC re-reruns it on Christmas Eve). Sorry, but I turn a deaf ear and a blind eye whenever some cynic tries to convince me that this enduring classic is nothing but cloyingly sentimental Capra-corn. Indeed, I’ve always been struck by the movie’s hard edges and dark undercurrents as it considers the life of George Bailey (James Stewart at the top of his form), a small-town savings-and-loan manager whose grand ambitions have always been stifled by civic duty and family responsibility. On a particularly bleak Christmas Eve, he thinks of suicide as a way to end what he feels has been a useless, worthless existence. (Hey: Been there, felt that.) But George sells himself much too short. And thanks to the intervention of a guardian angel, he comes to appreciate that his life has touched and enriched many other lives, much the same way we all affect (for better or worse) the people around us, often without our knowing. 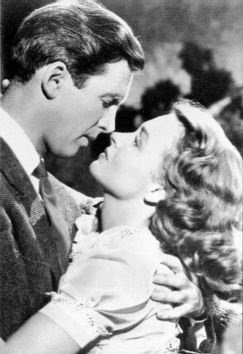 For the past two or three decades – thanks in large part, of course, to countless TV airings -- It's a Wonderful Life has become enshrined as America’s official Christmas movie. But don’t let that keep you away if you’ve never seen it, or want to see it again: It speaks in an optimistic and encouraging voice to all of us, and can brighten your spirits at any time of the year. On the other hand: I suspect Cassavetes also would have enjoyed a version of It’s a Wonderful Life starring bunny rabbits.